1. Preheat the oven to 200ªC, gas mark 6. Heat the oil in a frying pan and fry the courgettes for 2-3 minutes in 2 batches, cut-surface down. Transfer to an ovenproof dish. 2. Melt the butter in the same frying pan, add the leeks and fry for 4-5 minutes. Season, then spoon on top of the courgettes. 3. Sprinkle over the cheese and walnuts. 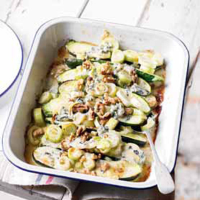 Bake in the oven for 20 minutes until the walnuts are crisp and the vegetables tender.